I’m a little obsessed with this brussels sprouts salad. Does that make me weird? You don’t have to say it. I know I’m weird. I’m weird enough that I just had to ask on Twitter: Brussels sprouts? brussels sprouts? brussel sprouts? My first instinct was the right one. But I’ve been seeing it spelled differently, with lower case, no s, and even an apostrophe, so I was temporarily confused. People, they were popularized in the city of Brussels in the 1300s, apparently. So they are sprouts from Brussels. The New York Times says we can make them lower case, if we want, since they have been popularized enough that we can refer to them colloquially, not as a brand name, per se. I’m stubborn and old-school. I was going with Brussels sprouts. Well, I’m all for less formality, actually. And frankly, if The New York Times and the production editor of The Guardian suggest that I put this in lowercase, that’s where I’m going. Brussels sprouts salad? Really, Shauna? You might find that you have a certain feeling about brussels sprouts. In fact, for most of you that feeling might be Ewwwwww! This salad will change your mind. Danny and I first ate a version of this salad at Picnic, a wonderful place to buy pork campagne and a container of butternut squash soup, then grab a bottle of wine for a spontaneous gathering. (They call it a food and wine boutique.) It’s here in Seattle, run by our friends Anson and Jenny. Actually, they were Danny’s friends first, when they all cooked together at a restaurant called Cassis. After cooking and serving food in that small space, Danny went on to cook at the restaurant we wrote about in our cookbook . Anson and Jenny got married. She went to cooking school. He worked at Crush. The restaurant business is tough on the feet, the hands, and the mind. After awhile, Anson and Jenny decided to leave those more-than-full-time night-time jobs and open Picnic instead. We’re so happy they did. Picnic is a series of small perfections. Walk into Picnic and you’ll find a calm, spacious room with a well-stocked deli case at the end. Great wine, local honey, lovely chocolates, pots of jam and Rancho Gordo beans  Picnic has a good selection of foods you want to eat. Anson and Jenny have handpicked every single one with attentive care, focusing on local and small-batch made. They’ve never steered us the wrong way. I love the quiet minimalism of Picnic. 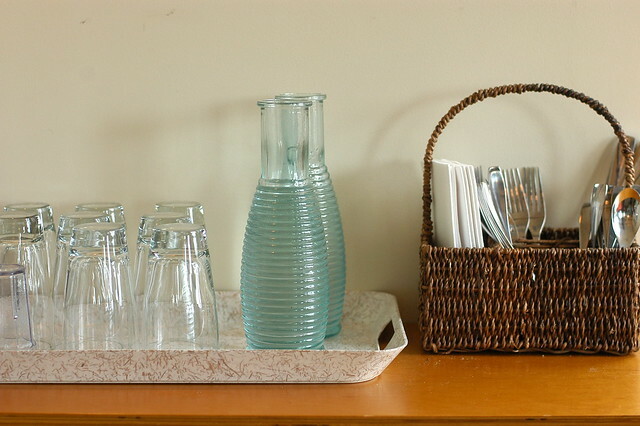 Last year I took a photo of this  the water glasses and silverware basket on the side wall. I had it as the desktop on our computer for awhile. I found it so calming. This is the dream  a house that feels like this. Of course, with an enthusiastic 2-year-old with an uncanny ability to open just the drawer you don’t want her to find, this dream is far off in the distance for us. So we stop into Picnic. We feel good when we are there. There’s an Ernest Hemingway quote I love: “What’s moral is what you feel good after.” I don’t think he meant the empty head-rush kind of feeling good. I read it as the feeling you have when you have been sitting with a sure-headed friend, the one who makes you laugh and reminds you of the best version of who you can be. When you get up to leave, you feel strong in the gut and light at the same time. Plus, their food is tremendous. Anson’s pork rillettes are creamy, melt-in-the-mouth bites. His patés resist the fork for a moment, then yield. They’re as good as Danny’s. (That’s saying something for me.) Their soups are smooth and full of bold flavor. And they make salads that make me long for vegetables. A couple of weeks ago, we ordered this brussels sprouts salad, with aged cheddar and crumbled walnuts. We had a few bites of salumi, a bit of paté, some butternut squash soup, then an entire plate of this. I could have eaten another 3 plates of this. So I have. At home. With a food processor’s slicing blade, a bag full of brussels sprouts becomes greens, slightly nutty, bright and different than you imagined. It’s good to have your perceptions of the world shift, a bit. Good friends, and good places like Picnic, can do that to you. A few weeks ago, Melissa Clark came to Picnic to promote her wonderful new cookbook. If you don’t know Melissa’s Good Appetite column in the Wednesday New York Times, you are missing out on the opportunity to cook good food. She has a wonderful way of mixing both ordinary ingredients with a few unusual ones and creating dishes that you want to make instantly. Most Wednesday evenings, I do. We met Melissa when we were in New York recently, at a brunch thrown by my good friend Jennifer Perillo. I felt a little awkward before meeting her. I’m such a geeky fan of her writing and food. Would I be able to string a sentence together coherently? We walked across the street to Picnic, where she had a conversation with my friend Molly in front of several dozen gathered people. Afterward, in the ferry ride home, I realized while looking through her beautifully written book that Melissa has a raw brussels sprouts salad recipe too. Really, why resist? You need this. We’re making it for Thanksgiving this year. You can make this salad any way you wish. We have made this with aged cheddar cheese, Manchego, and hard goat cheese. Try pecans or pine nuts or almonds. Youll be wanting to eat your sprouts. No kidding. Put the sprouts in a large bowl. Add the cheese and walnuts. Put the apple cider vinegar, olive oil, and mustard into a small jar, along with the salt and pepper. Put on the lid and shake that jar until the vinaigrette has come together. p.s. someone in the comments said she made the dressing for this with maple syrup. well, thank you so for saying that! we tried it tonight — 1 teaspoon of maple syrup — when we ate this salad again. hoo boy! that’s good too. it brightens the dressing in a really lovely way. try that too. Next to cranberry, quite possible one of my most favorite foods. I love them roasted. I am going to give this a try very soon! I love 'em too; this is making my mouth water! YUM! Thanks for posting; can't wait to try it!!! I just made a similar salad 2 nights ago! Mine was shaved brussels sprouts, walnuts, dried cranberries, pancetta, and a dressing from apple cider vinegar, olive oil, dijon, and maple syrup. Love, love, love brussels sprouts! I just bought a very similar salad to what I think your recipe is from trader joes. I loved it! I actually also added the trader joes cooked lentils which was delicious! Is there any way I could please have your recipe? My father-in-law and I are the only people at our family's Thanksgiving gathering who are happy to see the brussels sprouts every year. I feel everyone else is missing something really good. Perhaps I'll make this salad and bring it, without identifying the ingredients, and see what happens. I'd enjoy watching a few minds change. 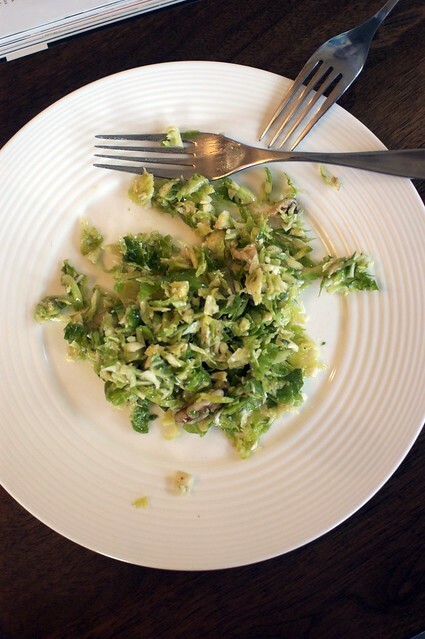 My husband and I adore Brussels sprouts so I will definitely be trying this salad. I made my first salad with the sprouts a month or so ago and it was such a different taste that I look forward to doing it again. I am not a brusselsprout-phobe. They're fabulous roasted. But never, ever have I contemplated having them raw. But why not? They're essentially tiny cabbages, right? So I intend to try this recipe soon! Many of our members at the Coalition for Better Thyroid Care report that they have found that eliminating gluten helps them feel better. And that includes me….the achiness that I had thought was all thyroid-related evaporated when I gave gluten up. Thanks for your contributions to raising awareness that leaving gluten behind can be a good thing….and on so many levels. This is very similar to an asparagus walnut salad I've learned to make (http://bit.ly/begHRm). Therefore, I KNOW this salad of yours would be delish. i love brussels sprouts too! i can't wait to try this salad…yummy! I have already posted on fb how I love brussels sprouts but that salad recipe looks so yummy I am making it tomorrow!!! All my favorite flavors I can't wait. ohmygoodness!!! I ate brussels sprouts for the first since I was forced to as a kid!!! I saw your newest blog entry and it was like a sign. Recently a friend of mine told me how she sautes her brussels sprouts. Then, Jessica Seinfeld's posted on her blog to not fear the brussels sprouts. As soon as I saw your recipe, I ran out to the store to pick up some sprouts…..I had no idea what I was even looking for, but guess what I found?? Brussels sprouts so fresh, they were still on the stalk! Whipped up your salad and I am now a brussels sprouts convert! YUMMO! As someone who got in trouble when I lived at home for microwaving enormous bowls of brussels sprouts and eating them straight (and "stinking the joint up"), I'm so impressed by this cheesy version that words can't convey. Thanks so much, Shauna! I know the extra s at the end is proper considering the food's history, but I really want to petition that it go away. I'm a brussel sprout fan. That's how I say it, so that's how I'm going to type it. Regardless, I love them sauteed, but if I need to use them up soon, I might have to try a version of this. I'm getting to where I don't mind a raw cabbage type flavor. Yum. Love brussels sprouts. I usually just roast them, but I definitely think I will be trying this out tomorrow night. I knew there was a reason I bought Brussels sprouts tonight! My favourite vegetable, hands down. all the posts about B-sprouts are killing me because I've always loved them, even when I was a little kid! I found this blog because I read about you in the Los Angeles Times article by Rene Lynch. I read your story (on your "about me") page and I actually got a little emotional. Who is this healthy, vibrant woman with her healthy, vibrant man? I too, am a writer and married to the love of my life (who is also a chef). I've had a rough couple of years– after living most of my life as a size 4, I gained weight after the birth of my son and I've never been able to go back to my old self. My family is Portuguese and the thought of giving up bread and crackers seems incomprehensible. But maybe it's time to try. I'm tired most of the time, and I've started subsisting on oatmeal and fruit shakes (they make me feel better than solid food). Every trip to the bathroom is an ordeal. Every time I eat bread my stomach distends like a malnourished child's. Has celiac disease darkened my doorstep? Thanks for writing this blog. You've given me hope and ideas. I'm going to give it a try. Okay, I have to try this. I dislike Brussels sprouts (yes, even roasted, for those foodies who will insist I like them that way. I didn't stop being queer when I met the right man, either! ), but this sounds like if I'm going to like them, this will be the way. Gracias! I love your recipes and your words. Thanks. We had brussels sprouts twice last week because I too found them fresh on the stalk at Trader Joes, but there are a few left and seeing that salad made me want to get some more! Everyone in my family loves the brussels so our Thanksgiving challenge every year is a new way to eat them and I think I've found it! By far the kids like them steamed and smothered in lemon butter, but we have had them creamed and sauted with bacon too. Thanks for the salad recipe. I want to eat them raw! I have been OBSESSED with brussels sprouts lately. We've been having them roasted at least once a week for dinner for over a month. I cannot wait to try them raw in this salad–brilliant! Made a modified version of this tonight (I needed to bring down the calorie count & wanted to use ingredients I already had on hand)… SO good!!! My version is here: http://tinyurl.com/sproutsalad Thanks for the wonderful inspiration (as always!)!! Thank you for this! I'm going to make it for Thanksgiving, too! (Assuming I can get to the store on the icy Seattle roads today.) I had been thinking about making a lemony version with apples that Mark Bittman had written about in the NYTimes, but yours sounds much better! Yay! My sissy is allergic to lettuce and she CAN eat cabbage! She will LOVE this salad! Bless you! I have made this salad so many times already, Next version will have golden raisons and gorgonzola!! I saw this recipe when you first posted it and finally had a chance to make it. I did make the dressing you suggested but didn't like the taste so I did an olive oil with a good balsamic vinegar and it was superb! Thank you so much for posting this. While I love brussle sprouts I have never had them in a salad and this was a treat! We love this salad but hate Brussels sprouts! I’ve tried it exactly by the recipe and by adding or changing things. One change that didn’t work well was using pine nuts instead of walnuts. That detracted from the taste and cost more. One addition that we’ve tried and like is jicama, chopped up fairly coarsely. The added crunch is quite enjoyable. One that I’m going to try is putting in some pomegranate molasses, instead of the maple syrup that we’ve tried and like. Pomegranate molasses is something that we’ve just become fascinated by. I’ll let you know how we react to it. Fabulous! I’ve tried it with many variations – use green cabbage for the brussel sprouts and blue cheese instead of gruyere or Broccoli for the brussel sprouts and cheddar for the cheese. A little bacon can be included.You won’t kick me out for adding bacon I hope! my boyfriend would LOVE this! thanks for sharing and so happy to find your blog. i dont know too much about gluten free diets, but i am excited to investigate more! My family is a huge fan of brussel sprouts. I used to beg for them as a toddler. I can’t wait to try this. I think my dad will love it! I can’t believe it’s been almost a year since I first made this salad and it’s still one of my favorites I have made it so many times!! Wow, in doing research for my Brussels sprouts podcast I found this recipe – thanks to a tweet from @RMNutrition. I’ve printed the recipe and will try it soon. Thanks! As an aside, I’ve made this dish several times now, and my favorite additions to the core ingredients are pomegranate seeds or mandarin orange slices – they add a little sweetness and tang that I find perfectly balances the whole. YUM. I made this last Friday for a potluck dinner. At dinner, everyone said they liked it but I wasn’t so keen. With leftovers, I discovered that I enjoyed the salad better the next day. The flavours had had time to combine and the Brussels sprouts softened. I’ll make it again, but I’ll make it the day before I need it. Also: I put chopped barbecued chicken on one of the portions of leftovers and it was incredible. Are the Brussel sprouts supposed to be raw? I made this for a potluck because I love brussel sprouts and hate that everyone else doesn’t. Everyone liked it and asked for the recipe. I did add a few tablespoons of honey to cut some of the bitterness. Great recipe! I was a little skeptical I have to admit…I love brussel sprouts but I love them cooked. So I sliced into really little pieces like you said, and this was FANTASTIC!!! I used almonds instead of walnuts and added dried cranberries. mmmm you bet I am making this again. Thank you!! This looks delicious. I’m on my way to try the recipe! I had to make a few substitutions (almonds for walnuts and canola for olive oil) but delicious anyway. It was a tad too spicy from the Dijon for my three girls, who like Brussels Sprouts, so I tamed it a bit with some Agave Nectar to make it a bit more like a sweetish slaw. Can’t wait to try it with all of the right ingredients. Thank you! I make Chinese chicken salad with thin sliced raw Brussels sprouts instead of thin sliced iceberg lettuce. Yuk. I do not like spell check. Not yuk! YUM…. !